If all those April showers did their job last month, we’ll be enjoying the tradeoff as nature bursts into full blossom in May. 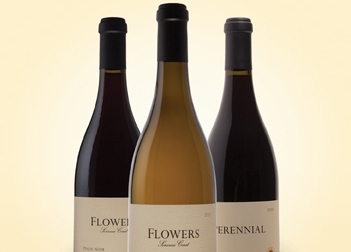 Add some bloom to your springtime sipping with a trio of wines from Flowers Vineyard & Winery. The Flowers estate vineyards sit atop ridges on the rugged Pacific coast in California’s Sonoma County. Maritime breezes and coastal fog nurture cool-climate plantings of Pinot Noir and Chardonnay, the favorite varietals of owners Walt and Joan Flowers. Flowers Sonoma Coast Pinot Noir sports a bouquet of sweet strawberries and tangy cranberries with an earthy undertone. Bing cherry, raspberry and pomegranate flavors carry through to a lingering finish, well balanced with bright acidity and soft tannins. This deep ruby wine pairs well with pork, beef or chicken dishes, and mushrooms and oysters. It complements a backyard barbecue as easily as an elegant cheese plate. The winery’s Sonoma Coast Chardonnay is a zesty collection of citrus aromas that lead to crisp apple and pear notes on the palate. A nice balance of acidity gives the light golden wine a vibrant finish. Grilled halibut with lemon beurre blanc sauce is an excellent pairing choice. Flowers’ newest offering is Perennial, a ruby red blend. The eclectic mingling of Pinot Noir, Syrah, Pinot Meunier, Dolcetto and Chardonnay offers an enticing fragrance of red fruits and sweet orange with spicy notes of nutmeg. Layers of plum and cherry flavors deliver a satisfying taste with depth and finesse. Serve with pizza, kabobs, grilled beef, roasted vegetables, soups and hearty salads.